Good afternoon! I hope everyone is having a great week. Today I have two pretties from Azature, the luxury nail brand made famous by their $250,000 and $1,000,000 bottles of polish. Azature's "regular" line is definitely more affordable ($25 each...which is still a splurge) and comes with a no-kidding black diamond in every bottle! 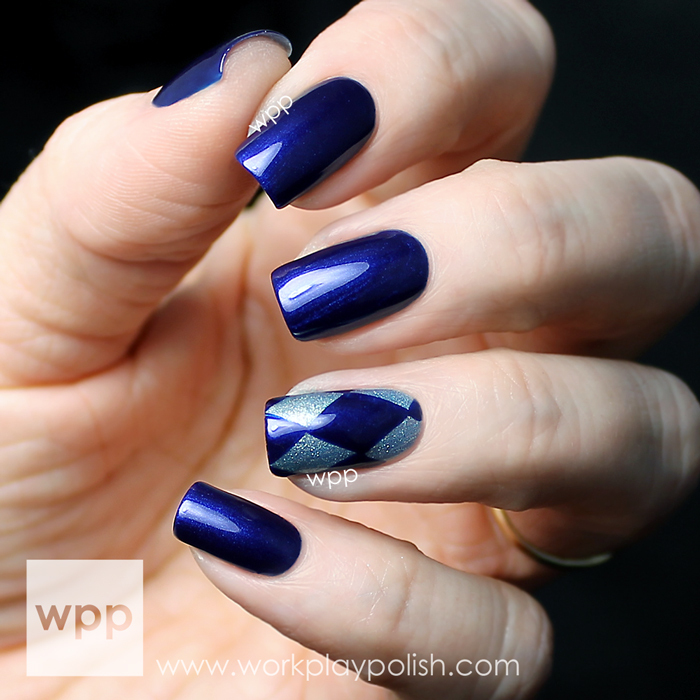 I snazzed up my swatches of Sky Diamond and Cobalt Diamond with a diamond-patterned accent nail (of course!). Cobalt Diamond is from the Winter 2013 release. It's a deep, rich blue shimmer. The formula on this one is amazing...really smooth and creamy. Apply and remove it carefully though. This has smurf cuticle potential! I'd definitely wear a base coat too. As the name suggests, Sky Diamond is a soft sky blue. The base is slightly frosty and loaded with ultra-fine blue glitters. The formula is a little sheer. I used three coats with a little VNL still showing in some light. Like all Azature glitters I've tried, the finish is crazy twinkly in the sunlight and my indoor shot doesn't do it justice! Azature Sky Diamond and Cobalt Diamond are available now. Azature polish retails for $25USD and is available on HSN and at Selfridges, Harvey Nichols Saudi Arabia, and Ron Robinson. Keep up with Azature releases and promotions on the web, facebook, twitter and YouTube.